The controversy over the proposed Meinung dam began in 1992. It would damage the local Hakka population and also the biodiversity of the Yellow Butterfly valley. The project was stopped. Meinung is a tobacco-growing community located in the mountainous region of southern Taiwan, where the majority of local residents are of Hakka ethnic descent. The controversy over the proposed Meinung dam began in 1992. The cost of the proposed dam was estimated to be US$4 billion (Liang, 1993). Upon completion, the dam would have supplied water to the region's growing heavy industries, including the proposed Binnan industrial complex at Chiku lagoon. In fact, planning for the dam began in the 1980s, but local people were not aware of it until 1992. The government's failure to disclose the project to the local community angered the communities and their leaders. A small group of local people, including teachers and scholars, initiated a movement that expanded into a broad coalition of residents and organisations. Between 1993 and 1994, the movement organised a series of protests in Taipei, persuading the Economic and Budget Committee at the National Legislature to eliminate the dam project. Meinung has long had a strong and distinct cultural identity as an agrarian Hakka community. The strong cultural identity transmitted to the outside world through literature and media has allowed Meinung to earn the name of Hakka Yuan-shian (home town). This strong cultural identity became an important component in mobilizing the community and constructing an argument against the proposed Meinung Dam. The book Return to Meinung (1994) represents a social and cultural manifesto for the movement. The book is divided into four chapters. The first two chapters present stories that tell the agricultural background of the community, particularly the practice of tobacco farming. It also includes an article on farmers' movement in Taiwan. The third chapter provides a critical reflection on the traditional role of women in the Hakka society. The documentation of the anti-dam movement appears only as the last chapter in the book. One of the most direct cultural and ecological expressions of the anti-dam movement, aside from the colorful protests, is the creation of an annual Yellow Butterfly Festival. The proposed Meinung Dam will flood 6.4 square kilometers of extensive forest in an area known as the Yellow Butterfly Valley.. Meinung Anti-dam Movement is arguably the most successful example of grassroots environmental movement in Taiwan. . Not only did it successively stop the government from implementing the project, the movement brought many members of the community together and articulated a vision of sustainable community with cultural and ecological characteristics. Robert Sung, the Chair of Meinung People's Association (MPA), characterized the outcome of the movement, "it's the anti-dam movement that brought people together and took Meinung back from a near collapse" . In later years Meinung has become a tourist destination. The MPA was founded in 1994 to protest the central government’s plan to construct a dam in the Twin Creeks catchment area of Meinong due to ecological and safety concerns, remembers in 2013 ) the organization’s secretary-general, Chiu Jing-hui (邱靜慧). The MPA successfully mobilized locals and organized petitions against the dam, leading to the project’s suspension in 2000. Chiu notes that construction of the proposed dam would have destroyed a tropical forest as well as Yellow Butterfly Valley, which is home to more than 110 butterfly species and 90 kinds of birds. The association also viewed the dam as a threat because its nearness from downtown Meinong. Instead of opting to build a massive dam, Chiu’s association proposed adopting a low-impact, sustainable approach to managing water resources. Measures such as repairing and maintaining water pipes and recycling and reusing waste water should always be investigated before the decision to build a dam is made, she says. After authorities resolved in 2000 not to build the dam, Chiu says the MPA shifted its attention to other issues such as promoting conservation, providing environmental education and pushing for the restoration of damaged areas. 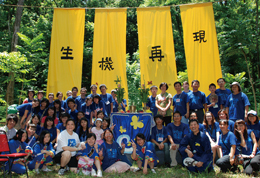 The association, for example, holds a ceremony and summer camps in Yellow Butterfly Valley each year to promote local conservation efforts and awareness of the need for coexistence between humans and nature. Relevant government actors Government of Taiwan. Environmental justice organisations and other supporters Meinung People’s Association (founded in 1994). Children's Ecology Camps (founded 1997). Development of Alternatives The Meinung People's Association was established by a group of farmers, local political leaders, youth who had returned home, and local artists. The group organized meetings in opposition to the reservoir, and through a series of lectures and publicity events, gradually created a mood of local opposition to the plans. Eventually, the Legislative Yuan Budgetary Committee decided that a new review on water resources in South Taiwan was required and removed funding for the reservoir. The ideals and efforts of the Meinong residents ended in a major victory. The Meinong People's Association stated that opposition to the reservoir was only a start, and that the movement would continue into the future. Following a number of initiatives over the years, a movement that started in opposition to a single reservoir has grown into a broader water conservation movement. In addition, since 1995, a regular "Meinong Yellow Butterfly Festival" has been held at the proposed site of the reservoir on the Shuangsi River to promote environmental education. In 2004, an "International Conference on Dam Alternatives" was held, realizing the benefits of previous exchanges by bringing in scholars and experts to Taiwan to share knowledge and experience from overseas. Why? Explain briefly. The project was stopped by the government after much local protest. Epistemic communities and grassroots movements. The case of Meinung dam. 2004. Thesis, Carleton University. Courtney Beaubien. (Analysis of the role of outside international experts). Song on the Meinung dam. To those who give a dam, Mu Qian 2008-04-11. Songs about farmers' lives in Hakka dialect may not sound trendy, but Taiwan Hakka singer Lin Sheng-xiang's music has not only won him four Golden Melody Awards in pop-dominated Taiwan, but also taken him to perform throughout Asia, Europe and America. Taipei Times, 25 June 2000, Born in the anti-Meinung Dam movement and lauded as one of the best groups of 1999, Labor Exchange has stayed true to its roots and remains one of Taiwan's only protest bands. By Yu Sen-lun.